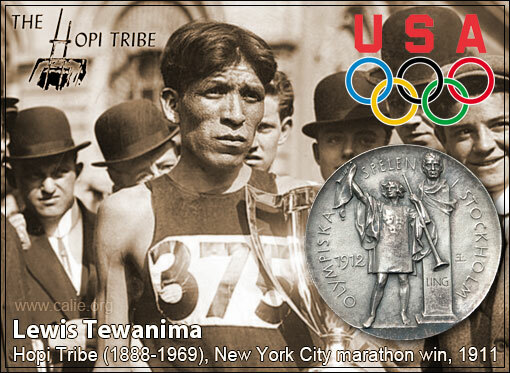 American Indian Olympic Medalist Lewis Tewanima pictured in 1911 after winning a marathon in New York City (caption). 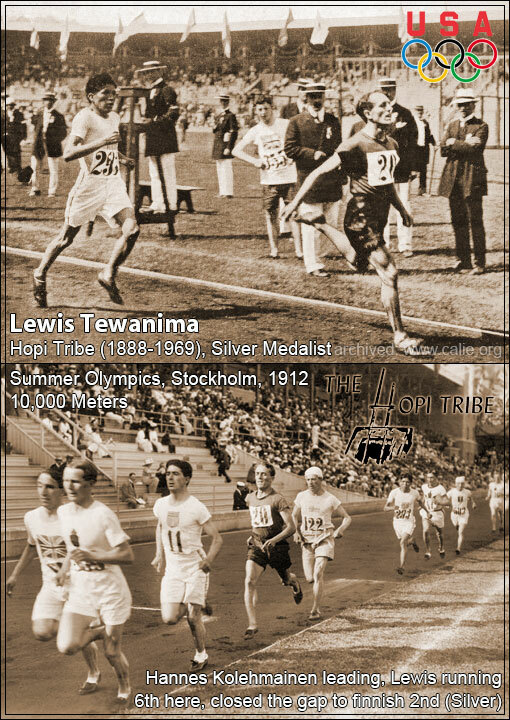 Hopi tribal member Lewis Tewanima (1888-1969) is famous in American history for winning a Silver Medal for the United States in the 10,000-meter footrace at the 1912 Summer Olympics, Games of the V Olympiad, in Stockholm, Sweden. 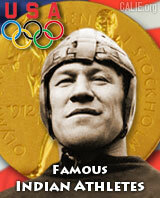 Lewis Tewanima was also a standout Carlisle school Native American Indian athlete who competed alongside such early 20th century Olympic sports legends as Jim Thorpe (Sac & Fox Indian). 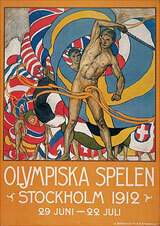 Games of the V Olympiad: Hannes Kolehmainen (Finland) leads the pack in the 1912 Summer Olympics, Stockholm, Sweden — Lewis Tewanima (#293), pictured running sixth, eventually closed the gap and finnished second to win an Olympic Silver Medal for the United States. Lewis Tewanima also participated in the 1908 Summer Olympics in London, England, United Kingdom, where he finished ninth in the men's marathon. Billy Mills, Oglala Lakota (Sioux) from Pine Ridge Indian Reservation, ran the 10,000-meter race some 52 years later at the 1964 Summer Olympics in Tokyo, Japan, and won the Gold Medal for the U.S.
At the 1912 Olympics, however, Lewis' Carlisle school mate Jim Thorpe (Sac & Fox) won Gold Medals for both the pentathlon and decathlon, and Andrew Sockalexis (Penobscot tribe) finished fourth in the men's marathon. 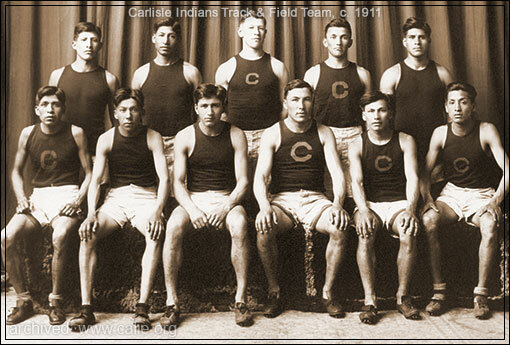 Carlisle Indians track and field team photo (c. 1911) pictures 1912 American Indian Olympians Jim Thorpe (standing center) and Lewis Tewanima (appears seated far left, but at least one credible website has him seated far right). Lewis beat nearly 1,000 runners and won first place in a 1911 New York City marathon (he is pictured above holding his first place trophy). 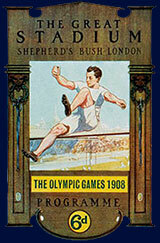 Probably 1,000,000 persons witnessed the contest which was the greatest in some features in the history of athletics. 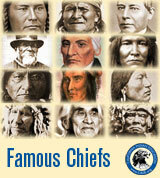 Tewanima, who represented Coach Glenn "Pop" Warner’s Carlisle Indian School, had been a reluctant recruit — the U.S. 5th Cavalry had captured him on the Hopi reservation in Arizona in 1906 (his "crime" was a refusal to attend the government school) and shipped him east. 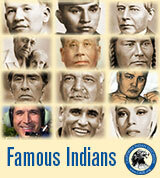 At the Carlisle School, Tewanima learned the tailor’s trade — but he was often away racing. 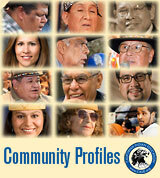 Produced by Ernie Salgado Jr (Soboba tribe).